The ATHE Level 5 Extended Diploma in Business and Management 2018 has been designed for learners who wish to develop the skills and knowledge required for roles in management roles. It is a 120-credit size qualification and is the equivalent level to the 2nd year of a degree. The content of this qualification is a focus on business organisations in a global context, people management, and finance for managers as well as an understanding of the research skills. Learners must complete 4 mandatory units worth 60 credits in total and further 4 optional units totaling 120 credits to achieve the ATHE Level 5 Extended Diploma in Management. These qualifications are designed for learners from aged 18 and above. All course material, including presentations, handouts, and assignment briefs and e-books are made available to enrolled learners. In addition to this, the learners also get the course handbook and tutorial via emails to support the learning. The Diploma is issued by the ATHE – Awarding Organisation. 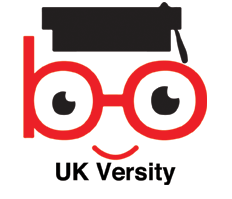 UK Versity Online Limited (Number 889) is an accredited and approved delivery Centre for ATHE qualifications. Upon successful completion of ATHE Level 5 Extended Diploma qualification there are a number of progression opportunities available to learners. a level 6 ATHE qualification (Gen Ed) route on successful completion of the required units at level 5. Completion of the Mandatory units listed, will ensure learners have acquired the second level of study for meeting the General Education (Gen Ed) Core requirements and fulfilled the necessary credits at Level 5.
the final year of degree programmes at some universities (see Progression Routes on the ATHE website). * The fee includes registration and assessment fees. There is no other hidden cost.